The Tehran Conference was the first of two meetings of the "Big Three" Allied leaders—Premier Joseph Stalin of the Soviet Union, U.S. President Franklin Roosevelt, and Great Britain's Prime Minister Winston Churchill—held at the request of the U.S. President at the height of World War II. As World War II raged around the globe, Roosevelt began calling for a meeting of the leaders from the key Allied powers. While Churchill was willing to meet, Stalin played coy. Desperate to make a conference happen, Roosevelt conceded several points to Stalin, including choosing a location that was convenient to the Soviet leader. Agreeing to meet in Tehran, Iran on Nov. 28, 1943, the three leaders planned to discuss D-Day, the war strategy, and how best to defeat Japan. Wishing to present a unified front, Churchill first met Roosevelt in Cairo, Egypt, on Nov. 22. While there, the two leaders discussed war plans for the Far East with Chiang Kai-shek, at the time the Chinese director of the State Council, the equivalent to President of his country. While in Cairo, Churchill found he was unable to engage Roosevelt regarding the upcoming meeting in Tehran, and the American president remained withdrawn and distant. Arriving in Tehran on Nov. 28, Roosevelt intended to deal with Stalin personally, though his declining health prevented him from operating from a position of strength. The first of only two wartime meetings between the three leaders, the Tehran Conference opened with Stalin brimming with confidence after several major victories on the Eastern Front. Opening the meeting, Roosevelt and Churchill sought to ensure Soviet cooperation in achieving the Allies' war policies. Stalin was willing to comply: However, in exchange, he demanded Allied support for his government and the partisans in Yugoslavia, as well as border adjustments in Poland. Agreeing to Stalin's demands, the meeting moved on to the planning of Operation Overlord (D-Day) and the opening of the second front in Western Europe. Though Churchill advocated for an expanded Allied push through the Mediterranean, Roosevelt, who was not interested in protecting British imperial interests, insisted that the invasion take place in France. With the location settled, it was decided that the attack would come in May 1944. As Stalin had been advocating for a second front since 1941, he was very pleased and felt that he had accomplished his principal goal for the meeting. Moving on, Stalin agreed to enter the war against Japan once Germany was defeated. As the conference began to wind down, Roosevelt, Churchill, and Stalin discussed the end of the war and reaffirmed their demand that only unconditional surrender would be accepted from the Axis Powers and that the defeated nations would be divided into occupation zones under U.S., British, and Soviet control. Other minor issues were dealt with before the conference's conclusion on Dec. 1, 1943, including the three agreeing to respect the government of Iran and to support Turkey if it was attacked by Axis troops. Departing Tehran, the three leaders returned to their countries to enact the newly decided war policies. As would happen at Yalta in 1945, Stalin was able to use Roosevelt's weak health and Britain's declining power to dominate the conference and achieve all of his goals. Among the concessions he gained from Roosevelt and Churchill was a shifting of the Polish border to the Oder and Neisse Rivers and the Curzon line. He also gained de facto permission to oversee the establishment of new governments as countries in Eastern Europe were liberated. Many of the concessions made to Stalin at Tehran helped set the stage for the Cold War once World War II ended. "The Tehran Conference, November 28-December 1, 1943." The Avalon Project: Documents in Law, History and Development. Lillian Goldman Law Library 2008. Web. May 30, 2018. 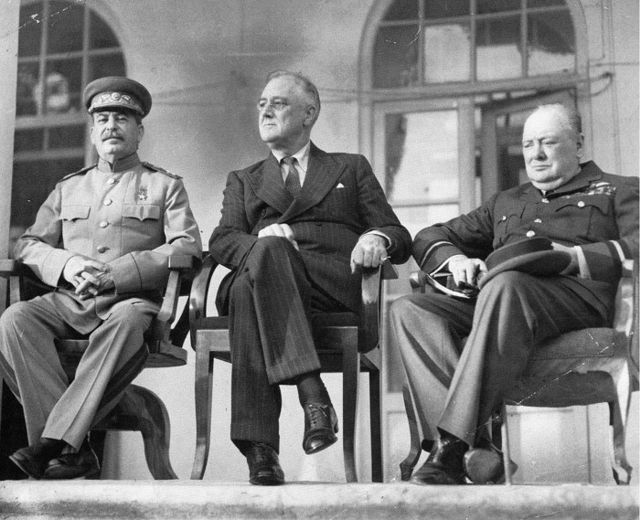 "​1943: Allies United after Tehran Conference." BBC: On This Day. BBC 2008. Web. May 30, 2018. "The Tehran Conference, 1943." Milestones: 1937-1945. Office of the Historian, Bureau of Public Affairs, United States Department of State. Web. May 30, 2018.